Buying Glossier’s Phase 2 set was probably the most exciting customer experience I’ve had ever since I started buying things online about a decade ago. Rarely have I been as desperate getting my hands on new products. How did the IntoTheGloss spin-off manage to capture my attention the first time I read about Glossier on IntoTheGloss, and keep me engaged and thrilled until after I had received my order and tried its products? It turns out it’s all about WOW-ing the user during every step of her customer journey. Here’s a summary of my experience plotted along the AARRR Startup Metrics framework. (See Figure 1, click image to view full size). I’m randomly browsing IntoTheGloss when I see a Glossier banner of a #GRWM (Get Ready With Me) Youtube video from founder Emily Weiss. Emily herself starring in a video? I need to check that out! I realize that ITG and Glossier are related, and that Glossier is a webshop that sells makeup products. Right before clicking through to Glossier.com I am skeptical because I can’t believe any non-well-established cosmetics company (IntoTheGloss is ‘only’ a beauty blog, I tell myself at this point) would think of launching a makeup brand in the saturated industry. Once I land on Glossier, however, I am really surprised by the fresh look of the website. The models on the homepage have a healthy glow and don’t look like they’re wearing tons of makeup. I decide to check out _Generation G, Glossier’s lipstick. Immediately I notice the skintone overview, which I find particularly handy. Overall, I like what I see and decide that it’s worth checking out more of this brand. We’re off to a surprisingly good start. User status: I land on Glossier via IntoTheGloss, and don’t abandon: I check the homepage and the_Generation G product page. My first visit is positive and lasts about 3 minutes. Mental state: From skeptical to curious. Purchase intention: _Generation G looks really great on the models. Who knows I might purchase one in the future. After my positive website visit I decide to check out the #GRWM video from Emily that initially triggered me to go to the website. Once I find out that the video shows Emily’s makeup routine with Glossier products I become really excited. I love the video and check out Coco Baudelle’s #GRWM video, which I love as well. While watching the videos I notice the Glossier product names showing up at the bottom of the screen, which I find super handy as I know which products to look for on the website if I decide to return to Glossier.com. After having seen the Youtube videos I start to get even more excited and decide to continue browsing for more information about the beauty brand. 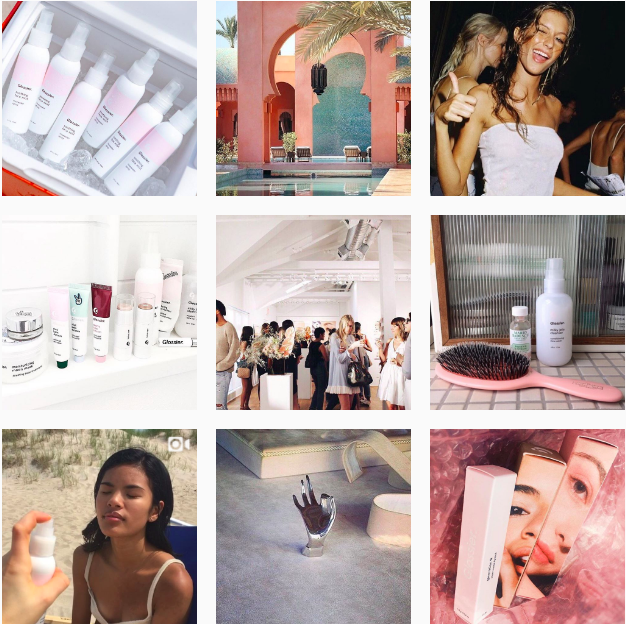 I land on the brand’s Instagram and find a great collage of short videos, inspirational photos, and women wearing Glossier products. I like the fresh look and feel and I’m especially impressed by all the fresh faces I see of employees, fans, ambassadors and models wearing Glossier. User status: Glossier’s Instagram and #GRWM Youtube videos have convinced me to continue exploring the brand. I’m officially activated. Mental state: From curious to excited. Purchase intention: My purchase intention increases. I’m inclined to get my hands on a _Generation G.
I check out more of Glossier.com, and find out they sell _Generation G in a makeup set together with a concealer and a brow brush. I don’t really need the latter two – neither do I really need a new lipstick – but it looks amazing enough on the models that at this point, I certainly want one. I also discover its skincare line. I visit Glossier.com multiple times because I still can’t believe how fresh, healthy and glowing the models look. Further, I decide to click through to some more #GRWM videos and become slightly obsessed. I replay Emily’s and Coco’s #GRWM videos several times, and then watch those of Tamira Jarrel, Chrisssstttiiine, and Cyndle. The products seem easy to apply and the ambassadors (genuinely) seem to love the products. All of a sudden it hits me that I haven’t checked out Twitter yet. I open the app and once I see the tweets mentioning Glossier my heart starts racing: I read dozens of comments from women saying the _Stretch Concealer and _Boy Brow are the best they have ever used. Ever loved a product so much you have back-ups for your back-ups? The tweets have an enormously positive effect, because I immediately change my mind about leaving the concealer and brow gel out of my purchase decision. The _Glossier Phase 2 set has now become a realistic buying option. I go back to Glossier.com to check whether it delivers worldwide. Negative. I tweet Glossier to ask when they start doing so. Customer service replies they’re working on it. As at this point, I’ll do anything to receive that makeup set, I reckon I could ask a US friend to receive my Glossier package and ship it to Amsterdam. I check shipping rates from the US to Holland on DHL. 35 euros, that’s not worth it. Visiting the brand’s Twitter and Instagram account and replaying Coco’s #GRWM Youtube video becomes part of my morning routine to check for updates. By now I’ve spent several hours browsing through the brand’s content. I’m beyond obsessed. User status: I check its website and social media channels at least 50 times and spend hours watching looking up all I can find about Glossier. Mental state: From excited to obsessed. Purchase intention: I have to get my hands on a _Glossier Phase 2 set one way or the other. Five months (!) after my first encounter with the brand I finally find a friend who’s planning to go on holidays to New York and is willing to pick up my package. I place an order for the _Phase 2 set and couldn’t be more excited (read my product review of _Generation G, _Stretch Concealer and _Boy Brow in my previous article). User status: I place an order. Purchase intention: I purchase a _Phase 2 set and am super happy with my order. Throughout the months leading up to the arrival of my package, I ask one of my US friends whether she has heard about Glossier. She tells me she hasn’t so I enthusiastically tell her to check out the website. A few weeks later, I meet my Dutch friend who was so kind to bring my Glossier package from her trip to New York. I greet her enthusiastically and tell her I’ve been waiting for months to receive the Glossier package. When she asks me what exactly I ordered I tell her all about Glossier and open the box to proudly show her what I’m so thrilled about. After having tried the products, I’m still a fan so I go back to my US friend and namedrop Glossier again and tell her it’s really worth checking out _Boy Brow. Once Glossier ships internationally, I’ll spread the word to my friends some more. User status: I namedrop Glossier a couple of times to my friends. Purchase intention: It’s done! Once Glossier delivers worldwide I’ll definitely consider placing a new order for _Boy Brow and _Generation G.
Glossier has been able to convince me of its products by WOW-ing me all along my user journey: my increasingly positive user experience on Glossier’s website and its social media channels combined with the enthusiastic feedback from Glossier’s community spurred my excitement for the brand throughout the Acquisition, Activation and Retention phase of my journey. 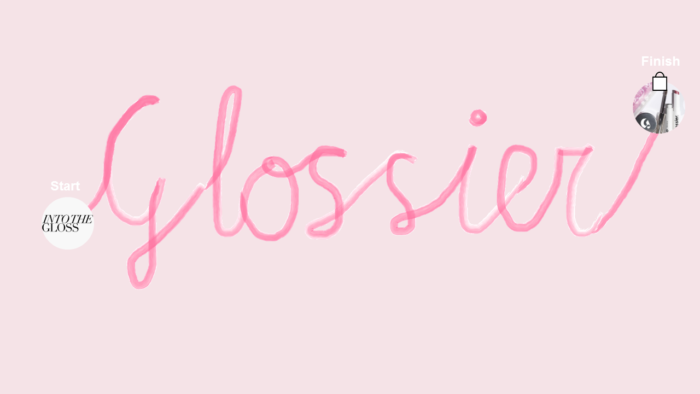 Its Twitter, Instagram and the variety of #GRWM Youtube and product videos captured my interest to the extent that I was frantically brainstorming on how get my hands on a _Glossier Phase 2 set. 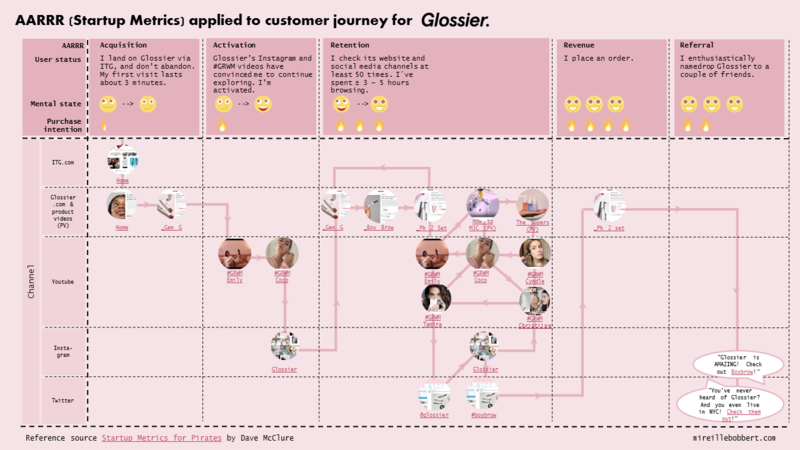 Once I’ve generated Revenue, received my package and the product experience meets my expectations, my positive experience with Glossier and its fans have motivated me to Refer the brand to my friends and convinced me to place a second order once Glossier ships worldwide. Regards. A good amount of material!